No cement, no grout and no need to remove old tile backsplash! 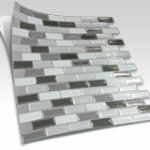 Smart Tiles www.thesmarttiles.com is an easy and inexpensive way to install a decorative backsplash in kitchen or bathroom. Cut (with Exacto knife), Peel and Stick. It’s that simple. Our rehab teams are stocking up on this product. 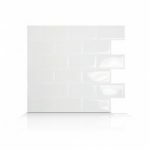 We recommend the Subway Tile shown below in white.